Prior to 1901, the predecessor and direct ancestor of the Aurora Public Library was a library known as the McClure Library. This "library" was basically a collection of books housed in a local jewelry store. The McClure Library eventually morphed into the Aurora Public Library Association, and in 1901, the library was moved into the City Building. This new location was replete with well-furnished rooms that were provided by the city and became known as the Aurora Public Library. In 1913 the Siemental Property on Second Street was purchased with monies of Georgiana Sutton in memory of her parents, Dr. and Mrs. George Sutton, and construction of the new library commenced. The dedication of the new Aurora Public Library was on Tuesday, October 13, 1914. A two-room addition was added in 1923, to house reference materials and to provide room for storage. 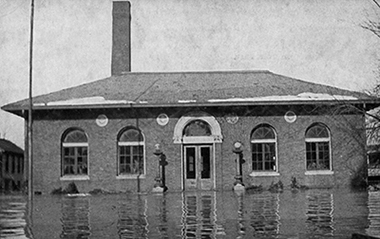 The 1937 Flood forced the Library to close and although there was no loss of books, there was heavy loss of materials stored on the lower level. In 1976, the basement of the Library was renovated to allow for a Children's Library to be moved in. This new expansion allowed for a growth in services dedicated to the children of Aurora. 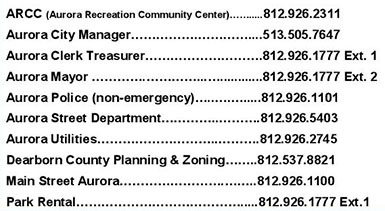 On May 27, 1993, the Library was recognized and placed on The National Register of Historic Places, and on February 7, 1995, the Aurora Public Library evolved into the Aurora Public Library District, offering library services to seven district townships. On February 1, 1998 the Aurora Public Library was once again reconfigured to the layout that can currently be seen today, with a ground level entrance, an elevator, and much needed additional footage. The Library has evolved many times over the years, and will most likely continue to do so in the future. As long as there are citizens who crave a good book, the Aurora Public Library District will be around to provide this much needed service. The history of the Aurora Depot property begins with John Gillis, a native of Scotland who came to this country in 1756. After serving as a patriot in the Revolutionary War, John sought a new life in the new frontier. Mr. Gillis drove a team of oxen west and settled in what was to become Aurora, Indiana. During the 1790's, Mr. Gillis erected a two-room cabin that served as a living quarters and trading post on what is now the location of the Aurora Depot. 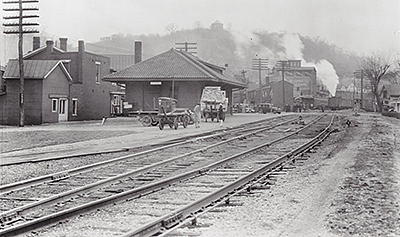 It would be another 50 years before the Ohio & Mississippi Railroad Depot was built, but on April 4th, 1854, the first train would pass through Aurora, Indiana. A Cincinnati train bound for Cochran, Indiana. The Depot building would be built twice and would be in service until 1916. During that period, ownership would change two more times. Baltimore & Ohio South-Western would take over in 1893, and then Baltimore & Ohio Railroad in 1899. In 1916, the third Depot building was constructed with the brick walls and tiled roof that you can see today. The Depot was sold be CSX in 1976 and is currently part of the Aurora Public Library District. Today it serves as a Local History Library, holding periodicals dating back to 1836, family histories, census figures, and a collection of books detailing the history of Aurora, Dearborn County, and the surrounding areas.